First thing this morning we went over to Hershey Chocolate World to see the sights. They have a “factory tour” which isn’t really a factory tour – it’s more like Disney’s “It’s a Small World” ride. It even has singing cows to tell about the importance of milk in milk chocolate. 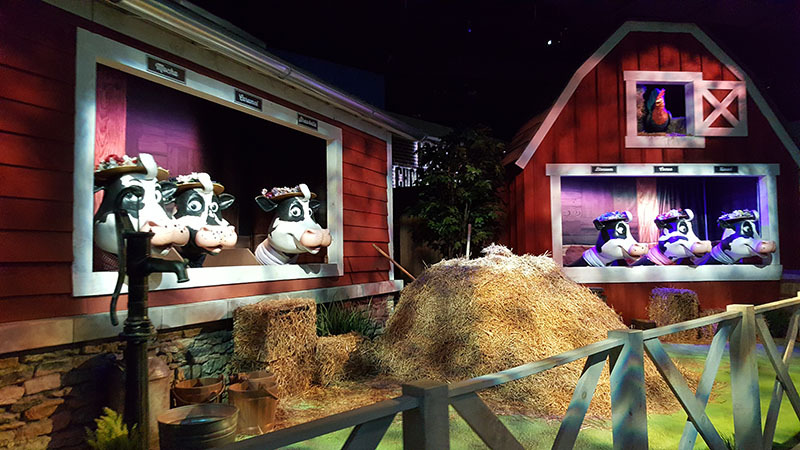 Okay, the tour/ride did have information about how Hershey chocolate is made. There were explanations of the milk, sugar, cocoa beans into cocoa, mixing, molding and packaging. There was also some trivia that was kind of interesting. That would be 2,389,000 miles. 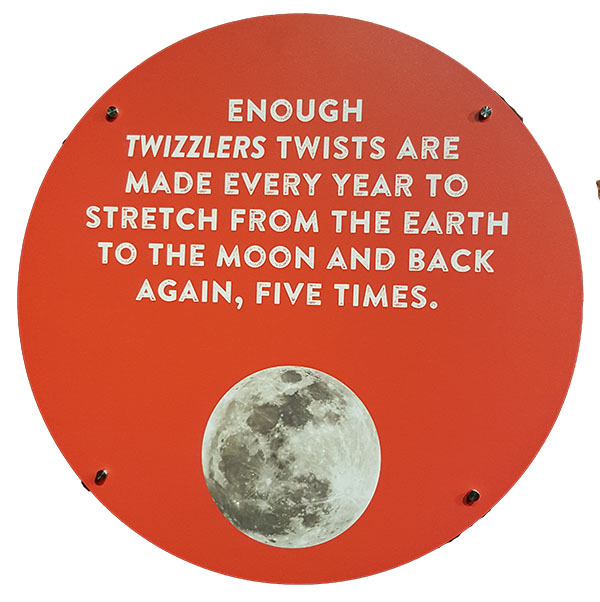 Of Twizzlers. Every year. There were some other activities, but we didn’t partake. There was also the biggest Hershey candy display I have ever seen in my LIFE! It focused on every sort of Reese’s Peanut Butter Cups (owned by Hershey), Hershey Kisses and Hershey chocolate bars. And me on a diet. So sad. The whole thing took about and hour, and the hardest part was figuring out where they wanted RV parking! After leaving Hershey Chocolate World, we headed north on Hwy 15 (after getting around Harrisburg). The highway follows the Susquhanna River up to Williamsport and after that, it goes though the most beautiful mountains. Good road, nice scenery, and a beautiful day – what more could you ask for? 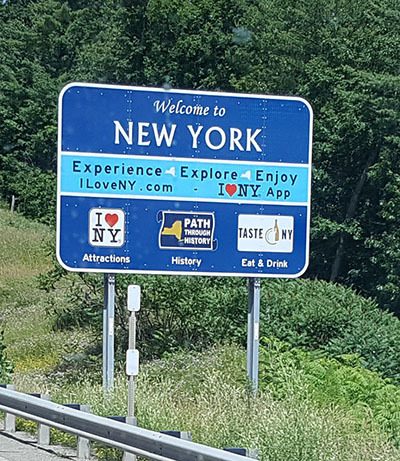 We crossed into New York around 2:30, after driving about 150 miles. Made it to New York! Next stop was the Corning Museum of Glass, in Corning, New York. They have an incredible display of glass, both contemporary and historical, along with active demonstrations and hands-on experiences. 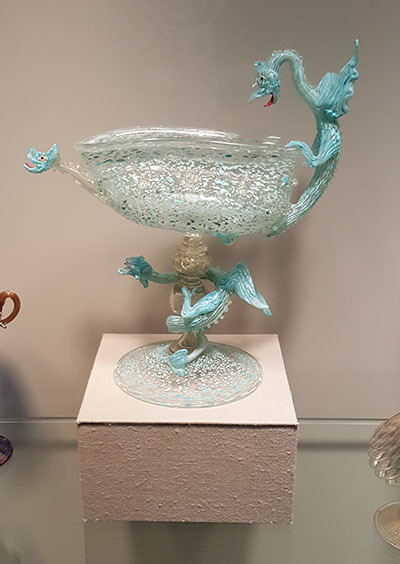 I’m not so into the “comtemporary glass art,” but I did find some of the historical pieces pretty amazing. Like this dragon dish – it’s no so old, but it’s quite striking. 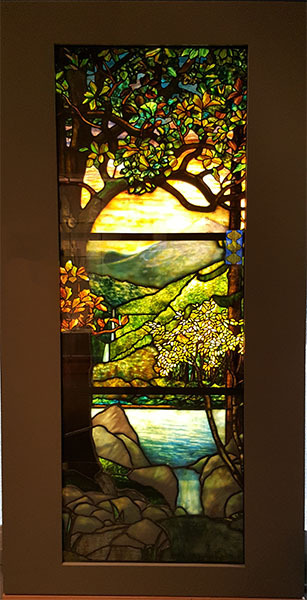 The current temporary exhibit is of Tiffany glass. This window is a good example. The craftmanship is outstanding. Landscape Window, about 1910. Louis Tiffany (1848-1933). The Corning Glass Museum also has the largest museum store in the country (maybe in the world). It’s HUGE. You can buy everything from imported glass Christmas tree ornaments, to one-of-a-kind glass art. I bought some earrings. All in all, good day!